Reader Renee sent this lovely pattern image to me — she's actually made it, and the pattern was her grandmother's. "Make it in a jiffy — then simply slip it over your head, wrap the back to the front and button — you're set for a dozen chores in and out of doors. Carryall pockets are a handy addition. 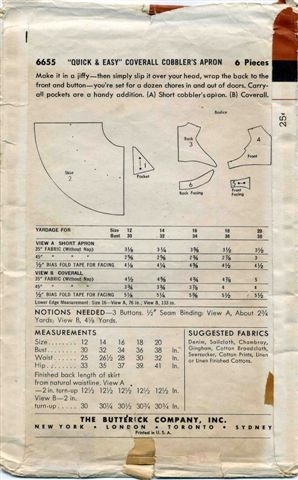 (A) Short cobbler's apron. (B) Coverall." The only other one I found online is at … and it's $35.00. I would love to go find Renee's grandmother and tell her that this Saturday knock-around dress pattern now goes for $35. Worth every penny, really, but still! The nice thing about this version (compared with the ) is that this one shouldn't have the skirt-riding-up problem that was reported. Oh, and it has POCKETS! Triangular ones! 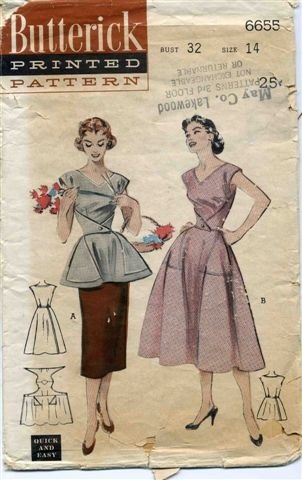 Peggy very nicely sent me the link to , which is for the June-July 1955 issue of Vogue Pattern Book. I used to collect these old pattern magazines until I realized that all they did was make me covet the patterns, which were then impossible to find. It's not like I could hie myself down to JoAnn's at the $3 Vogue Pattern sale and pick up a couple copies. Sadly, the one on this page that I really like (4544, lower right hand corner) did not reveal itself to the Questing Robots of Google, nor was it available in the Hanging Gardens of eBay. And the couple others I looked at from the listing images were AWOL from those places, too. Do you know what my favorite organizing principle is? (No, not "the pile", although if you've seen my office, that's an excellent guess.) My favorite organizing principle is "random". Things are nice and tidy and predictable when they're in categories and folders (and, yes, piles) but I like to choose things arbitrarily. Pick the fourth restaurant on the list and eat there. Opt for the book with the most colors on the cover. Talk to the person carrying the largest bag. Would someone please throw a party? Seriously, would someone throw a party? I know at least five people who need an excuse to wear this dress. We may have to wait a while, because flocked gingham (flocked TAFFETA gingham) isn't really a late-July, early-August kind of thing, but still. That last requirement is for the wearer, not the party … not everyone at the party has to wear red lipstick, although it wouldn't hurt. But seriously, that's it. How hard is that? This dress is from seller Tori at , and it's a nice larger size … B42,W34! This falls squarely under the category "What were they thinking?" I mean, really. I can't imagine any sane woman buying this dress and expecting not to have to constantly, um, *refocus* the conversation. Or feeling comfortable wearing it any place where she might possibly encounter fourteen-year-old boys. Of course, if you were of the right cup size to wear this dress sans support, you might enjoy a little bit of optical reinforcement. Maybe. Perhaps. It's a thought. Aw, hell, who are we kidding? This dress is a train wreck. One caused by the engineer taking his eyes from the track, actually. tipped me off that a bunch of eBay sellers are doing a special promo on the maxi-dress through August 8. The dress above is part of the promotion, and you can find other dresses by searching for the label TVMF ("The Vintage Maxi Factor"). Despite hardly ever wearing them, I *love* maxi-dresses. They're so hippie-glamorous. I feel that they should be worn at home, entertaining, with bare feet. There should be something jazzy playing on the stereo (or coming from your iPod), none of the seating should be more than eighteen inches off the floor, and all the drinks should be at least half ice. All of which would explain why I hardly ever wear maxi-dresses, because all the above prerequisites are hardly ever met, at least for me. But maybe I should relax a few of those conditions, so I could snap up dresses like this. This one is COTTON (a lot of those maxi-dresses are synthetics, which I really don't like) and it's got such a great print! If only it weren't beige … I can't really wear beige, unless I want to practice looking naked and/or invisible. But if you had darker skin than mine (I will NOT say the dread word TAN) this would be gorgeous on you! And look both elegant and effortless at once. And maybe your feet wouldn't HAVE to be bare … flat colorful sandals would work. No heels, though. Heels with a maxi-dress is Trying Too Hard. This gorgeous maxi is from the eBay seller and is B38 … and in great condition! If you are looking for the perfect fancy beach party/casual outdoor wedding-guest dress for this summer, I think this is it. Make sure you hold one of those froofy parasol-required drinks while wearing it, though. That's one condition I won't waive. Remember the busy-day dress with the fancy pockets, the one I wrote about here? Well, I knew I'd written about it before, and there's the image up above (actual previous post is ). The bodice on the busy-day dress is different, as I mashed up one from another pattern … .